T–Box is a vertical awning that stores all functional components and the front profile inside the cassette for a neat aesthetic result. Shadow effects create an atmosphere dedicated to outdoor living, in harmony with the concept of refined simplicity. Structure made up of an Ã¸80 mm blind roller and a full cassette that shelters both cloths of the awning, when closed. Fully retractable awning suitable for covering large areas. 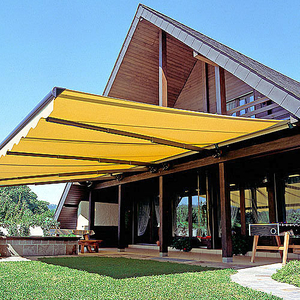 It features a tilting arm (patented by BAT) ensuring perfect closure of the awning. The patio awning protects from the sun's rays. The frame is usually attached to an exterior wall or above a balcony, and can be stationary or retractable. The fabric shading element can be made from a variety of materials. These devices are used outdoors to shade private or public spaces, such as home, hotel or restaurant gardens, terraces or balconies. In retractable models, the awning is attached to two articulated, folding arms. Stretched flat when extended, it rolls around a shaft when retracted. The arms fold parallel to the shaft. Operation may be by manual crank or electric motor.